In March of 2012, then-Mayor Rawlings-Blake convened the Baltimore Partnership to End Childhood Hunger to increase participation in federal nutrition assistance programs, and decrease childhood hunger in Baltimore City. Modeled after the Partnership to End Childhood Hunger in Maryland, the Baltimore Partnership seeks to engage state and local agencies as well as community leaders, elected officials and other nonprofit organizations in concerted strategies to eradicate childhood hunger. 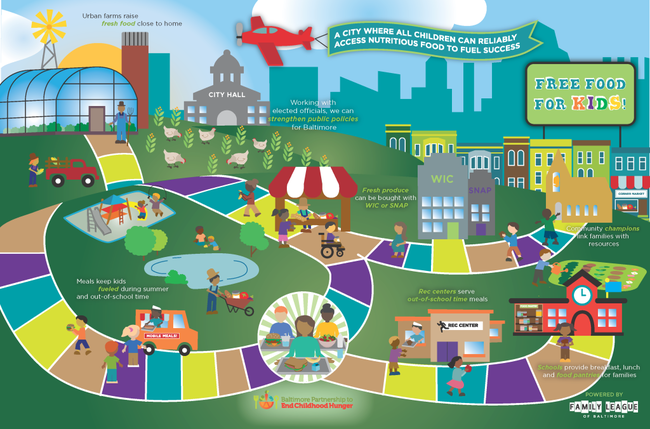 As a result of Mayor Rawlings-Blake’s leadership Baltimore has effective and innovative agencies that, together with the strong base of community organizations, can implement this plan to address hunger and nutrition issues that are specific to Baltimore City. The Mayor has already made tremendous strides in increasing access to healthy and affordable food in Baltimore City food deserts through her support of the Baltimore City Food Policy Initiative (BFPI), an inter-governmental collaboration with the Department of Planning, Baltimore Office of Sustainability, and the Baltimore City Health Department. The Baltimore Partnership to End Childhood Hunger will draw additional organizations to the table while building on the childhood anti-hunger work that the following partners have been undertaking for years.